I'll be honest, when Gates of Stone arrived in my mailbox, I wasn't sure whether I would give it a read. 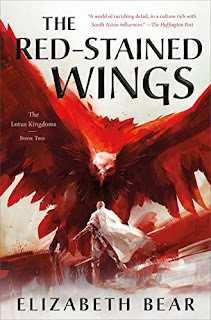 The promise of " rip-roaring action" I liked, and a "believable Asian-inspired setting" intrigued me, but "tense political drama" and the reference to grimdark pioneer Joe Abercrombie gave me pause. I've grown tired of the whole amoral, violent, dystopian turn of fantasy, finding it to be more something I want to escape from rather than escape into. It didn't help when the booked opened with a young woman murdering her husband in cold blood (although I did take a liking to Katerina right away), before switching to a young prince playing the coward card and hiding as his family is murdered around him (Jun was far more of a struggle to like). It also didn't help that there was such a focus on drug abuse, with the smoking of obat factoring into nearly every scene. And yet, despite all that, I preserved - mostly because I knew that Angus Macallan was a pseudonym for Angus Donald, and I hoped that his skill with historical fantasy would show here. Where the book started to win me over was at the close of the first part, as Jun watches Ketut, the skinny fisher girl, reveal herself as the vessel of a god (which is the first time the book really fulfills its magical promise), and Farhan picks up a musket in defense of Captain Lodi and his ship (which is where we get our first taste of large-scale, significant action). It is the opening of the second part, however, with Katerina paying an obat-addicted beggar to castrate himself (a fantastically chilling chapter), in order to demonstrate her intention to gather an army nation of obat-addicted slaves, where the book really began to come together for me. With that one cut, I went from doubter to believer, from reluctant reader to hungry for more. 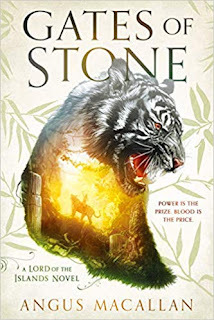 It took me the better part of a month to get through the first 160 pages of Gates of Stone, but less than a week to burn through the remaining 380. The world building is fantastic, and even if the mythology was teased out slower than I would have liked, it impressed me time and time again. 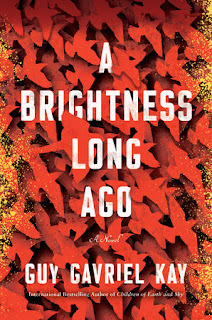 The storytelling itself was strong, very much coming across as a historical fantasy with elements of epic (think a darker, slightly less poetic version of Guy Gavriel Kay) and I am excited to say it never went where I expected it to go. More than all of that, the way the character arcs developed was astounding. There is real growth and development here, as plagued by doubts and frustrations as they may be, constantly adding layers to character motivations and personalities. 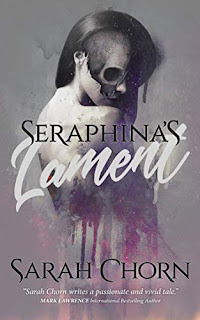 Katerina may very well be the most exciting character to grace epic fantasy in ages, and if the promise of the climax is carried through into the next book, I just may find myself an addict of a different sort, completely under her power.